Wordless Wednesday - Hey Baby, Hows About a Little Snog? I hate the winter. For many, many reasons. I hate snow. I hate to snow blow. I’m not a big fan of cold. It costs a fortune to heat your house through a long Maine winter. I hate losing the daylight. But most of all I hate it because starting in late fall and going through to spring, it is the dying season. If anyone or anything is going to leave this world, it seems they most often do so within this window. Facebook becomes one long memorial news feed. Greyhound after greyhound after greyhound crosses the bridge. Sure some go at other times of the year, but at THIS time of year it is an endless parade. Girly Girl left me during this window. dying season but to us he was special. Fox was Grammy and Charlie’s hound. If ever there was a dog who met the definition of autistic, it was Fox. He was stoic and patient. And stubborn. He wanted to be loved but on his own terms. You would never consider Fox a cuddly dog. Fox is also Blue’s half-brother. They shared the same Dam. They both raced at Raynham in the same kennel. Fox’s stubborn determination kept him on the track for quite awhile and he was one of his Dam’s top winning greyhounds. 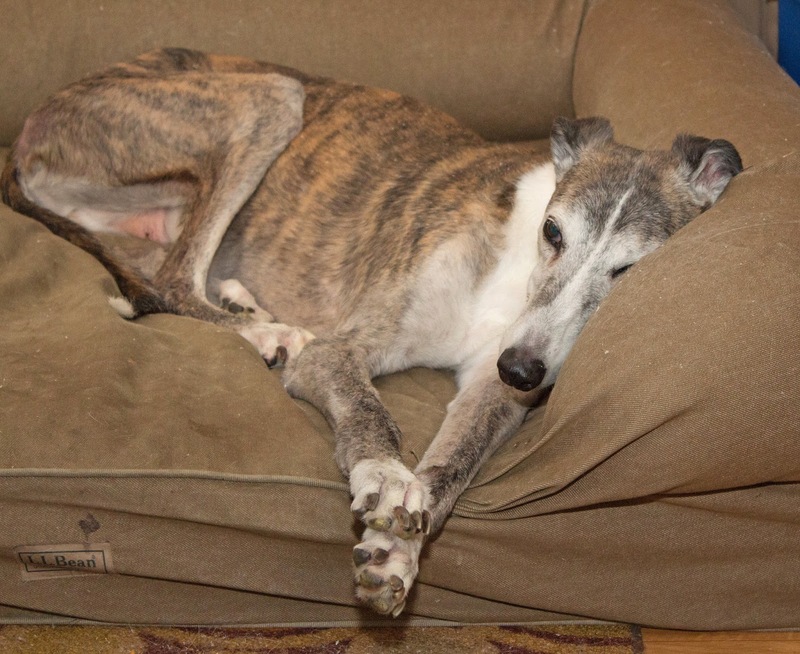 After he retired he went to the Maine Greyhound Placement Service and there his stoicism was a hindrance. Poor Fox lived in the kennel at MGPS for a year. No one was connecting with this amazing boy and he kept getting passed by. He had given up hope and even after a special article was written about him in the MGPS newsletter, he remained in the kennel. 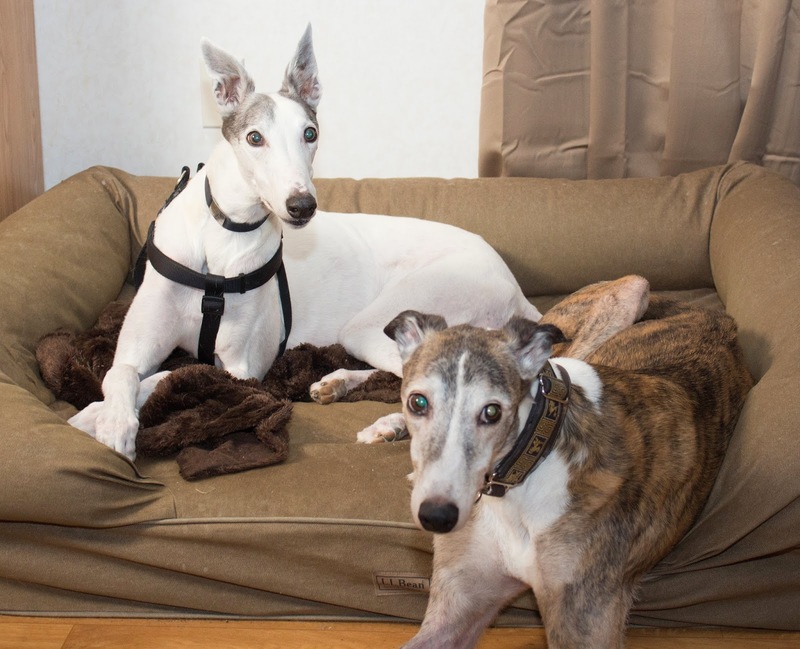 That is, until Grammy and Charlie happened along looking for their first greyhound. Once they heard Fox’s story it did not matter that he was an autistic boy. They determined to give him a real home. There was much happiness in the kennel as volunteers found out that Fox (whom they all called Foxy) was getting a forever home. Fox fit himself into our lives as though he’d always been there. He wasn’t much for playing with toys, but if ever there was a greyhound who loved him some dinner, it was Fox. He lived for meal times and treat times. 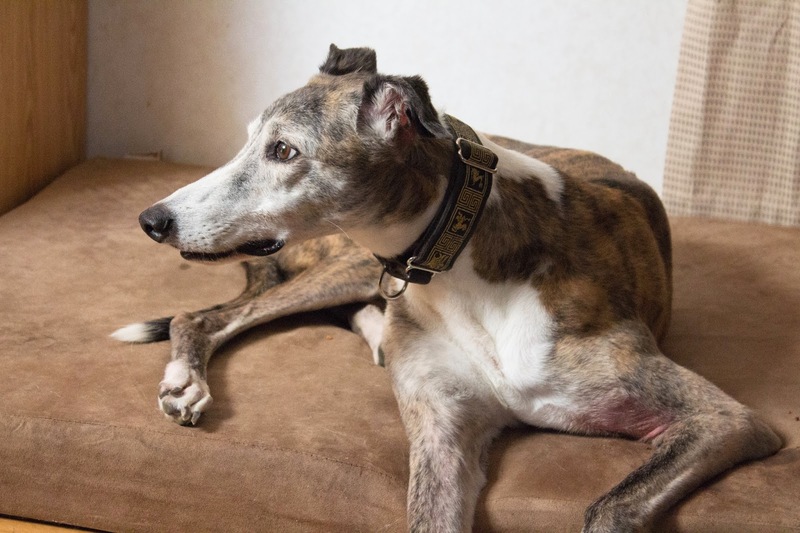 As he got older, like most old greys that I know, he began wearing little bits of his meals on his muzzle and chin as if he were saving them for later. Even with his autism, Fox learned to seek out a connection with the humans in his life. 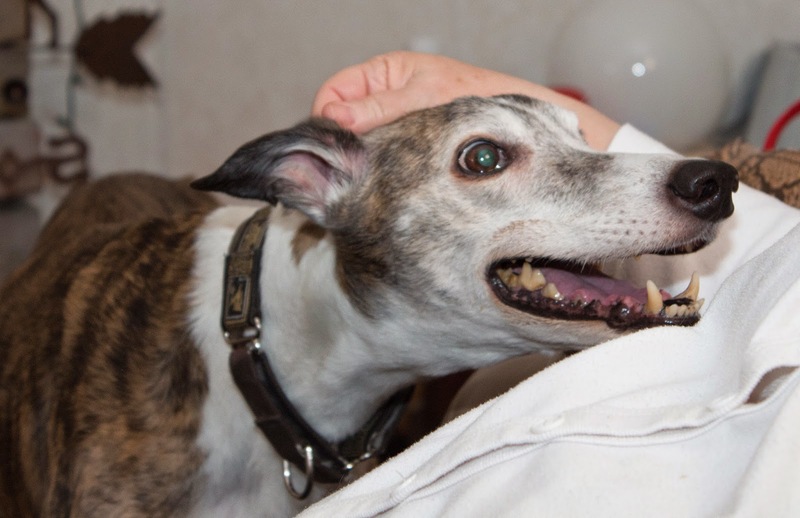 He would wait patiently in the line of greyhounds seeking attention and then he would present his side to you, carefully looking away and politely wait for you to pet him, or scratch him or rub his belly or ears. He would stand there until your hands fell off if you let him. Fox had a funny chirp that he would use when he felt you were not hopping to it quickly enough to get him dinner. It sounded just like a little bird. He would start out almost subsonic and gradually raise the volume. When he wanted to go out he would stand and face the front door. It didn’t matter that going out meant using the sliding glass doors on the back side of the house. When he first arrived at Grammy’s outside was through the front door and by god, that’s how it would always be for Fox. Fox never got on any furniture. It terrified him. We used to joke that the best way to persuade Fox to go lay down if he was bugging you to pet him was to invite him up on the couch with you. All it took was a quick “come on buddy, get up here with me,” and he would get the whale eye and start backing up and looking for an escape route. Depending on how serious he thought you were he would retreat to his bed in the living room, or for level 1 threats he would go all the way back to the bedroom and lay down in there. treatments with the patience and constitution of a block of granite. It did not matter what you had to do to him. It did not matter that it sometimes involved a lot of pain. He would always stand and bear whatever had to be done. There were a number of times over the past few years where we were sure that Fox was going to leave us. That it was time to release him. But in a couple days he would make a complete turn around and be fine again. Though each of these episodes took a toll and he was never quite as good as he had been before. Still, this weekend it was a surprise when the time where we would have to say our goodbyes finally did present itself. Grammy and Charlie held off, hoping like crazy for one more of his miracle turn-arounds but that was not to be. If Fox was in pain, he never let us see it. But he lost the ability to stand. Then he didn’t pee for 36 hours and when he finally did pee, it was because he had lost all control of his bladder. 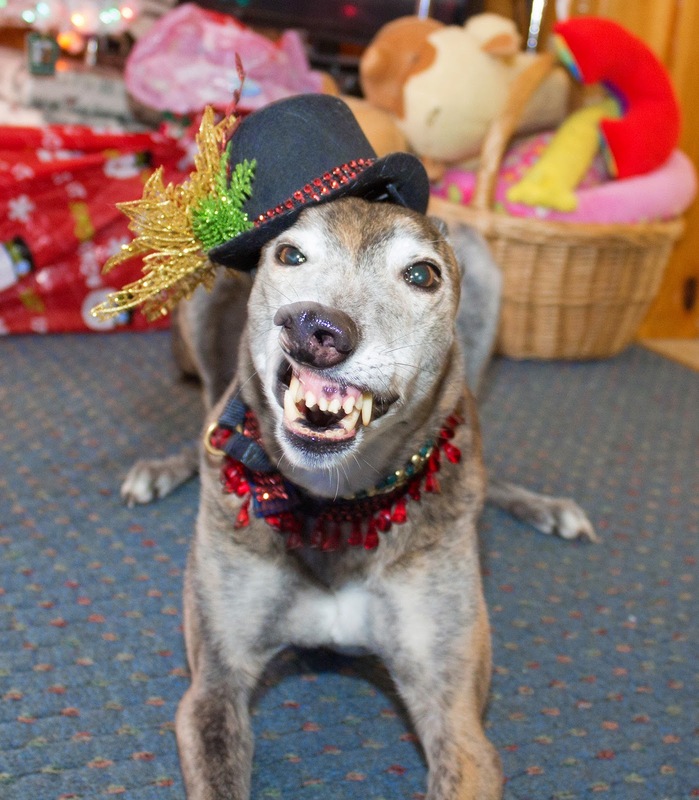 When the greyhound that lived for food above all else refused to eat, the time had come. It was a gut-wrenching decision. His eyes were bright and lively to the end. His spirit continued to be willing to go on but his body would not cooperate. Fox was 12 ½ years old. He had outlived all of his littermates. He had a good run and by rights lived at least a year longer than he probably would have if he had been a dog of lesser determination. But that doesn’t make it any easier. We let him go yesterday afternoon with people who loved him holding him as he went. He went as he had come and as he lived, with stubborn determination and with love. Run fast and long Royal Foxglove. Until we meet again.